This entry was posted on January 6, 2016 by Tinteán Editorial Team/EMcK, in Archaeology, art, Exhibition Review, History, News, religion, What's On... and tagged Art and Identity, British Museum, Celtic Art and Artefacts, exhibition, history. Bookmark the permalink. Further information: Celts is at the British Museum . The term Keltoi, we learn, was coined by the ancient Greeks to describe a number of linguistically related, but disparate groups spread out over northern and central Europe in the centuries before Christ. The objects presented here give a sense of peering through chinks in remote historical time, gaining privileged glimpses of a little known world. They’re more diverse, and often far more sophisticated than you’d expect. 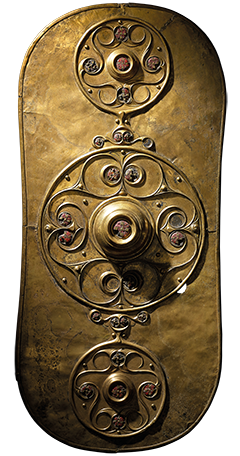 The exhibition is good on the way Celtic art absorbed other cultural influences, while extending its reach into European art for centuries to come. 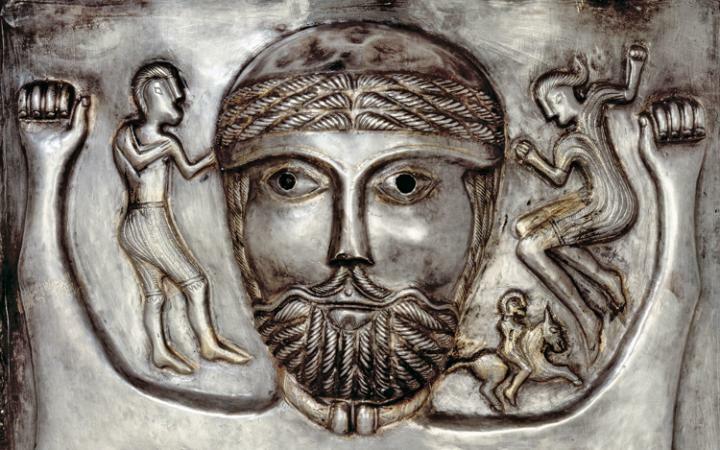 A spectacular silver cauldron unearthed in Denmark is formed from beaten and moulded plates with the glowering faces of gods ringing the outside and mysterious ritual scenes within. While the construction of the vessel looks fairly crude, the images have fantastic vitality, with antlered gods and figures blowing the carynx – the serpentine trumpet whose terrifying roar accompanied Celtic warriors into battle – evoking a vibrant mythology. At the same time there are stylistic elements that wouldn’t look out of place in Christian religious sculpture produced a good eight hundred years later. The objects here span well over a millennium. Elaborate interweaving, curving and twisting forms abound throughout, on shield boxes, mirrors and torcs – these neck collars displayed in glistening heaps as found in a dig in Norfolk. The clichéd interlacing curves we think of as typically Celtic, beloved of tattooists and makers of retro-Celtic jewellery, only start to appear in the later centuries.